Tablature is a system of notation in the Renaissance developed especially for fretted instrumens like the lute, guitar, lyra viol and vihuela. Stops for the left hand fingers are indicated by numbers or letters. Thus instead of the music itself, the way to produce it is notated. Various systems of tablature were in use. The earliest, German system was invented around 1470 for the then fashionable 5-course lute by the blind organist and luteplayer Conrad Paumann. It is based upon the idea that every position on every course should have its own symbol. As time progressed the lute gained more courses thus undermining this systems integrety. Above a luteneck is depicted showing all symbols used. 3 alternative ways of notating the 6th course are given in N2. Despite this drawback this system remained in use untill around the year 1600. 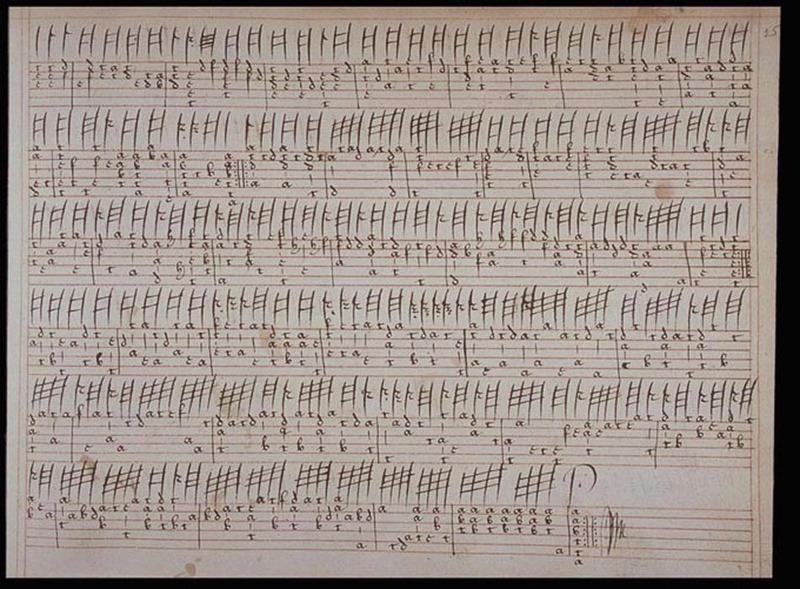 The last printed German tablature was issued in 1592 by Mattheus Waissel. The second system to be developed was the Italian tablature. Here lines were used to indicate the courses of the lute. the positions for the left hand fingers were indicated by numbers. This system proved to be much more flexible. One could increase the number of lines as the lute gained more strings. In the end this proved to be increasingly dificult to read so the maximum number of lines was to be 7. 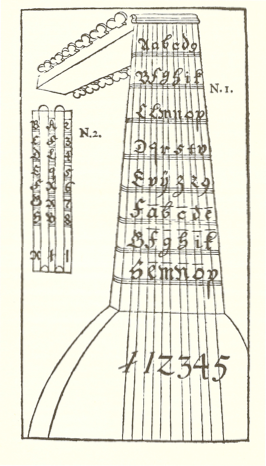 However 6-line Italian tablature remained in use towards the end of the lute’s popularity. Additional strings were indicated above the staff. The lowest line is the highest sounding string, frets are indicated by numbers 0 is an open string. The symbols above the staff indicate the rhythm of the fastest moving voice. The more flags, the shorter the note, just like modern music. The picture above shows a page from a manuscript from ca. 1517. It contains music by Messer Vincenzo Capirole. 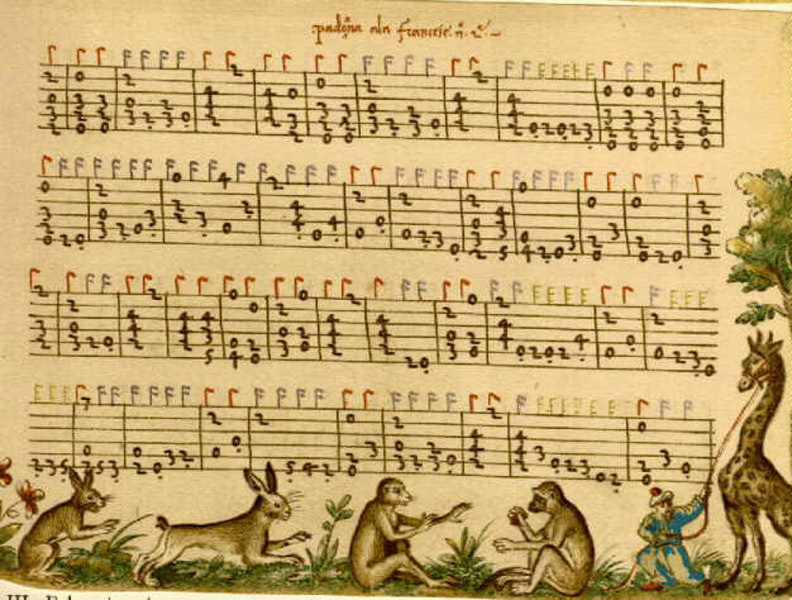 The writer, Vitali, a pupil of Capirola has illuminated the manuscrpt with drawings of animals in order to preserve the manuscript from neglect once the music would have gone out of fashion. This has proven to be very lucky for us because without this manuscript we would not even have known Capirola ever existed and his very beautiful pieces would have been lost. In 1529 the Parisian music publisher Pierre Attaignant issued “Très brève et familière introduction.” It contains a short introduction to lute playing and the first printed French tablature. Contrary to Italian tablature letters are used instead of numbers and the highest sounding string is represented in the highest line. The frets are indicated by capitals. Later publishers chose to use lower case to improve readability. This system would be in use untill the demise of the lute around 1780. French tablature: Semper Dowland, Semper Dolens, a famous composition for 7 course Renaissance lute of the equally famous lute virtuoso John Dowland (1562-1626) The Euing lute ms. c. 1595. Above a Sarabande by Johann Sebastian Bach (1685-1750) This is a adaptation for 13-course Baroque lute of the Sarabande in the 5th solo suite for Violoncello, notated in french tablature. Bach probably did not play the lute himself but he was befriended with Sylvius Leopold Weiss, who was the foremost player of his time. The courses 8, 9 and 10 are represented with up to three auxilliary lines whereas the numbers 4, 5 and 6 indicate courses 11, 12 and 13. Spanish Tablature. A pavan from El Libro de Musica de Vihuela de Mano intitulado “El Maestro” Valencia 1536. De composer Luis Milan was a dashing courtier at the court of the viceroy of Spain. Being the self-respecting courtier he undoubtedly was, he felt he shouldn’t give the impression of a working professional musician. His works were to be seen as the happy accident of a few idle hours. However his music is very high quality material. It wasn’t composed for the lute but for the Vihuela de Mano, which was as popular in Spain and some parts of Italy as the lute was in the rest of Europe. 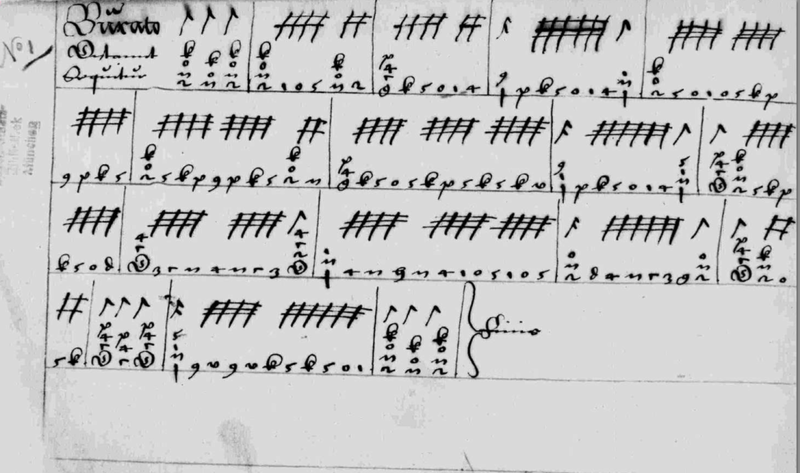 Napolitan tabulature resembled Italian tablature exept the number zero wasn’t used which means that open strings were indicated by the number 1.